VANCOUVER, BC & POWELL RIVER, BC – In conjunction with its recently released Winter 2018 issue, British Columbia craft beer quarterly The Growler has announced the latest release in the BC Brewers Collaboration Series, a line of beers co-created by pairs of breweries from throughout the province. 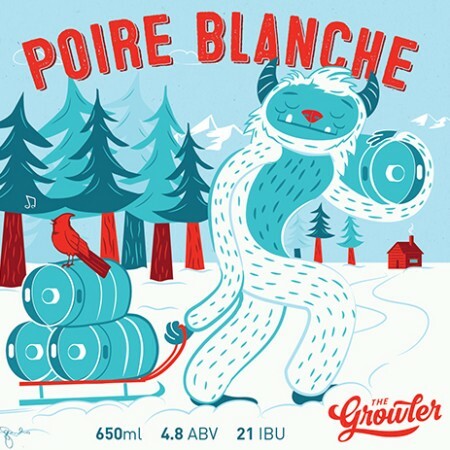 White as winter snow and fruitier than a partridge in a pear tree, Poire Blanche is what happens when two of B.C.’s foremost makers of Belgian-style beer team up for a brew. This witbier is brewed with B.C. pears and features Sterling and Cascade hops for a West Coast twist on the Belgian classic. Subtle pear and floral notes are complemented by a light citrus character that’s sure to get you through the winter. Poire Blanche is available in 650 ml bottles and on draught at both breweries. Bottles are also available at select private liquor stores, and ot can be found on tap at 12 Kings Pub in Vancouver and Coastal Cookery in Powell River while supplies last.